Last weekend was a weekend full of work around the house, getting Lydia's bedroom ready for her to move in. It felt great to work together as a family towards a family goal, and she has enjoyed spending time in there all week! This weekend was a weekend full of family fun, and it felt great! On Saturday, we had the opportunity to attend the Frys.com PGA Golf Tournament in Scottsdale. None of us had ever been to a golf tournament before, but Bo had watched plenty on television. We visited some of the sponsored booths, and settled in near the 18th hole to watch professional golfers hit their balls. It was fun -- the day was beautiful and we found a great spot to watch the play. Everyone laughed as balls landed in the water, and then another golfer hit his ball out of a sand trap, only to land in the sand trap on the other side! Lydia's highlight was the chance to ride a bus twice! (A shuttle took us from the parking lot to the course) and also a club car (which she called a go-cart.) The boys enjoyed it as well, and we have great memories -- but no pictures because cameras and cell phones were not allowed. 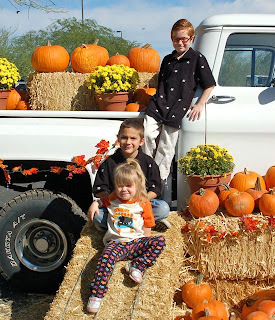 Today we visited the Desert Botanical Garden for the annual Pumpkin Festival. We've been going for years, and always have a wonderful time. Included in our annual membership is entrance to the Pumpkin Festival, which includes a hay ride to a pumpkin patch and the chance for kids to choose a pumpkin. This year, they also had some carnival-type games for the kids as we waited in line. Every year it seems to get a little bit better, and it is one of the best parts of having an annual membership to the Gardens. Lydia chose her pumpkin right away, with little consideration for the others. Most years, we've waited and waited for Colin to choose, but this year he chose rather quickly. He chose a medium sized pumpkin -- explaining it wasn't too small to make a good jack-o-lantern, but it wasn't too large for him to carry by himself. Nate took the longest this year, and finally chose a rather large pumpkin. In fact, it was too big for him to carry, so he rolled it around for a while before his father took pity on him and carried it for him. We'll take some time this week to carve them -- just in time for Halloween. The boys have been under the weather all week with a crappy cold, but were well enough this weekend to enjoy our outings. Sometimes too many weeks go by when we haven't done much as a family, and then we have weekends like the last 2 which remind me how much I enjoy doing things as a family (beyond the normal day-to-day living) I'm glad we carved out the time, and can't wait until the weather cools a bit more so we can enjoy more outdoor activities! Hi Melanie! Just saw your comment in MamaBuzz and wanted to say hello and welcome! I appreciated the link to the PR data... that's exactly the type of stuff I love to learn!